Going into the 2018 NFL Draft, the Buffalo Bills had two major needs that they had to fill. The first was obviously quarterback and the second was middle linebacker. In order to achieve the goal of filling those two glaring needs the Bills had to do some draft day maneuvering in order to accomplish those goals. The Bills had as much draft choice capitol as any team in this draft and it was because of that, they were able to pull off the trades needed to acquire quarterback Josh Allen and linebacker Tremaine Edmunds. With the Bills holding the 12th pick in the first round they were not in a good position to draft one of the top four quarterbacks in the Draft. They were going to have to trade up in order to acquire one of them. General Manager Brandon Beane played the waiting game and to his credit resisted having to pay a fortune to get in the top five. He waited until Tampa Bay was on the clock at seven before pulling off a trade. The good news is that he was able to move up without having to give up his second first round pick. So by still having that extra first he was able to fill both needs in the first round. That was key, as the inside linebacker class in this draft was weak after the first three players and getting a player to do what Sean McDermott wants at the Mike LB position would have been difficult. After the Bills selected quarterback Josh Allen with the seventh pick in the first round the Bills started to try and get themselves into position to get one of the top inside linebackers. The top three inside linebackers in this draft were Georgia’s Roquon Smith, Virginia Tech’s Tremaine Edmunds and Boise’s Leighton Vander Esch. There was no way the Bills were going to get Smith as he was a sure top 10 player. The next two were Edmunds and Vander Esch. 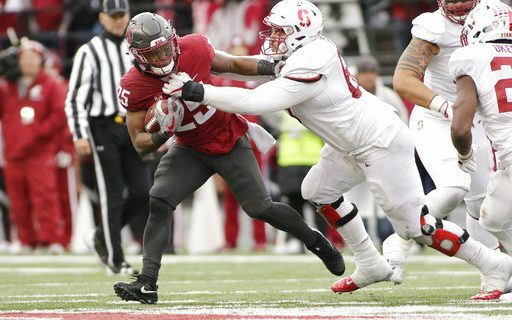 A month ago many felt that Edmunds could be a top 10 selection also but while his age (19) works for him when we look at his upside, it worked against him a little also. Edmunds has unlimited potential but right now he lacks the instincts of a player like Smith. Given his age, he will become much more instinctive but right now I would call him more of a reactor than an anticipator. What Edmunds has is the ability to play in the middle of the field very well but because of his rare athleticism, he can also be used in other ways such as an edge pass rusher in certain situations. That versatility will give the Bills a schematic advantage once Edmunds gets up to speed as an NFL player. Getting back to the Draft, the Bills had no chance to select Edmunds with their number 22 selection. They could have waited to see if Vander Esch dropped to them but that was a risk also. To make sure they got Edmunds, the Bills moved up to number 16 to take Edmunds. Looking back, it was a wise move as Vander Esch went at 19 to the Cowboys. Had the Bills waited, they would have been out of luck as far as finding a viable Mike linebacker. While it cost the Bills draft capitol to make those trades, they filled important needs. The rest of the draft was helpful for the Bills also. In the third round the Bills were able to select defensive tackle Harrison Phillips. While Phillips won’t be asked to be a starter in 2018, he has starter talent and he will be a valuable rotational player as a rookie. When Kyle Williams retires, he will step into that position. What is nice about Phillips is that he has the versatility to player either defensive tackle position at a high level. While he may not have to natural athletic traits of some other defensive tackles in the draft, there are none who play with his outstanding competitive nature. He is all-out snap to whistle every play. He will never be a 10 sack a year guy but he’ll get five or six a year and be excellent playing the run. Fourth round pick Taron Johnson is a good fit for the Bills scheme. He is best suited to line up as a slot corner and is effective in both man and zone coverage. Though he comes from the FCS level of comp, he showed at the Senior Bowl that he is capable of playing with top competition. Don’t be surprised that he is the Bills starting slot corner by mid-season. Wyatt Teller is a big, strong inside offensive lineman who plays an aggressive game. While he will start out at guard, center may ultimately be his best position. Both wide receiver selections are geared more towards playing in the slot than outside. Both have a high degree of quickness with better that adequate speed. Right now seventh round pick Austin Proehl is more ready to contribute than Ray-Ray McDonald because he has better hands and is a better route runner. McDonald at this point is more of a specialist who can return kicks and come up big when used on gadget plays.